A collection of chops handed down to me by the outgoing Studio Manager Jimmy Manning. These are what's left of the very first chops used on the first 50 years of prints published by Kinngait Studios via Dorset Fie Arts. As well as the signature chops there was also the igloo chop. 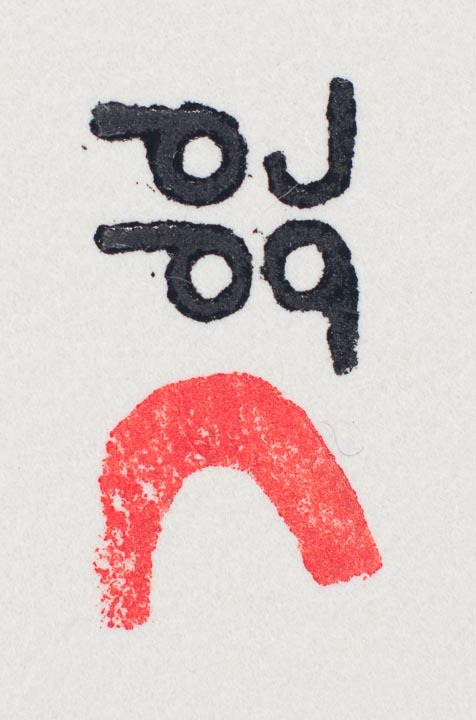 The igloo chop indicates that the impression was printed by Kinngait printers in Cape Dorset or by traveling printers to various events, it is the official indication that the impression was instigated by Kinngait Studios/Dorset Fine Arts. I am familiar with most prints executed from 1988 until present so I went through the early print archives (1959-1961) to familiarize myself with them, a real treat. In this day and age of corporate and product branding, Kinngait was ahead of the curve. The difference is of course that since people had to make each chop by hand there was a tendency for uniqueness and I want to illustrate that here. Wallace Brennan 1975. Wally was the Master Printer for the Kinngait studios for a decade, 1974-84. 1974 Wallie Brennan arrived and brought with him the Tamarind sensibility. By having the actual artist signing the impressions themselves, it provided a way for the artist to personally approve each impression. 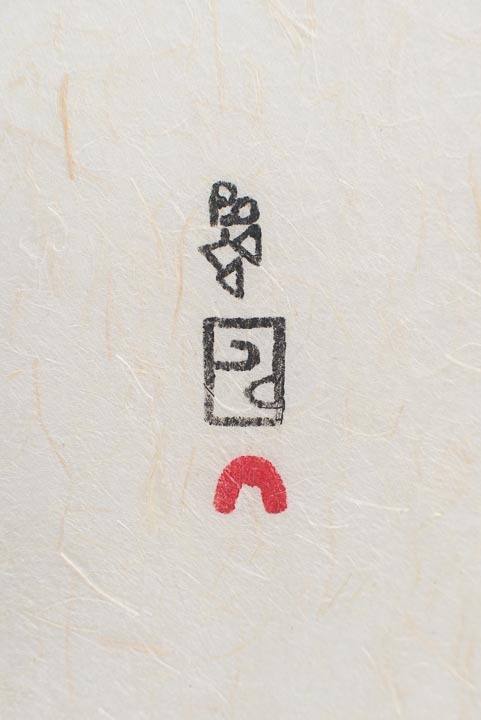 The chop signatures were applied by the printers and not the artists so it could be suggested that the artists had no idea of what was done to their image/design, taking it yet another step away from their control. Everyone knows that the printers cut the blocks and print the editions, so the artists really have nothing at all to do with this process. But since it is all done transparently within the studios and in the community, the artists are often happy to have the printers execute their images on their behalf. It is part of the circle of effort inherent to the co-operative structure. I know what people are going to say and rightly so. Those of you not familiar with syllabic orthography are going to want to know which impressions these chops are associated with and what year, who the artist is and who is the printer . However, my intention is to show you in a graphic way of how idiosyncratic and beautiful the chops are and how the igloo chop has evolved over the early years. The second last illustration has four chops on the print. The top is the artist Ohotaq Mikkigak, the printers chop Lucta, the igloo chop in black ink and lastly the Eskimo Arts Council chop which reads na ma (soft ka) tu or "good enough". 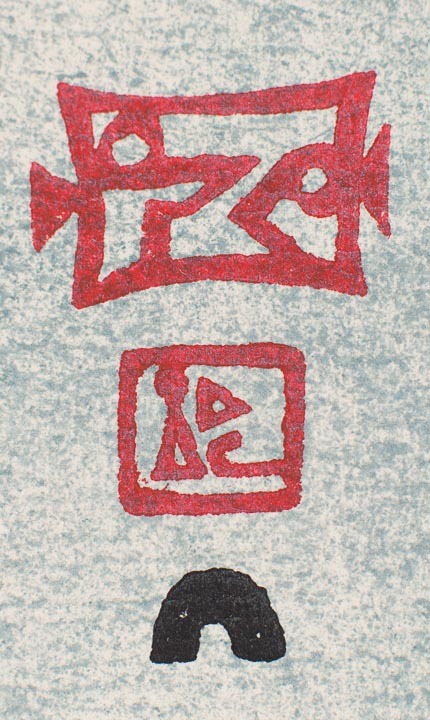 This chop and sometimes a blind stamp were added to the print as a way of authorization by the council to show that this group selected this print edition to be included for sale. Notice as well the second last line of chop images, the two on the right. The upper chop is the artist Parr. The second chop below that is the printer's chop, Lukta. On the far right example, Kenojuak's chop is on the top, below that is the printers chop Talu. After lots of conversations with Joemee Takpaungai it is thought that this is in fact another version of the printer Lucta's chop. Tulie (also Tuliq/Tulik) was a carver and drawer that was loosing his sight and eventually went blind. 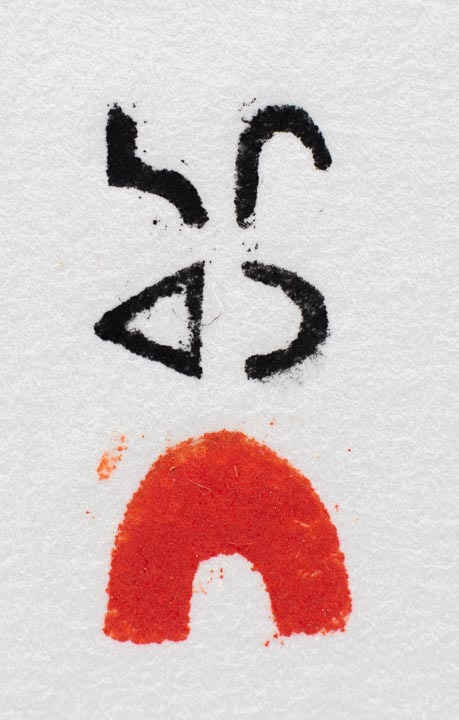 In the 1961 catalog there is a chop with Tudlik's name, perhaps this was an artists signature chop and not a printers chop? Later in the same 1961 catalog there is a well known image of Tudlik's, a hunter about to harpoon a seal and his chop is at the top of the stack of other chops, this is the position of the artists signature chop. Another example of the inverted Lukta chop. I expect I am seeing these in the archives because they were culled from the edition and not released, as it should be. Another example of the Lukta chop inversion. It is fortunate for those of us studying the archives that these impressions still remain here for us to see first hand. Three stone cut proof prints in the archives. As you can see this is a Parr image and his name should be at the top of the totem of chops which indicates respect for the artist. Below the artists chop is the printer Otoki but the last impression you can see the chops became misplaced. The paper that his print was printed with is remarkable, a real challenge for the printer. This Kingmeata lithograph has a lot of information. The Eskimo Arts Council blind chop is mid frame, Pitseolak was the printer. Does anyone out there know who designed the Eskimo Arts Council chop? There are other interesting evolutions as well. The WBEC chop shown here. This "blind" chop appears on all current prints published by Kinngait Studios and Dorset Fine Arts. I have seen very thin versions of this chop well as the above fat WBEC chop. When I find a good reference I will post the thin version for comparison. Mixing the right ink, rolling it out and then rolling the chop into the ink to pick up enough. NiviaksieQuvianaquliaq (literally means jumps for joy) applies the store bought igloo chop above the WBEC blind chop on Arnaqau Ashevak's lithograph basket. 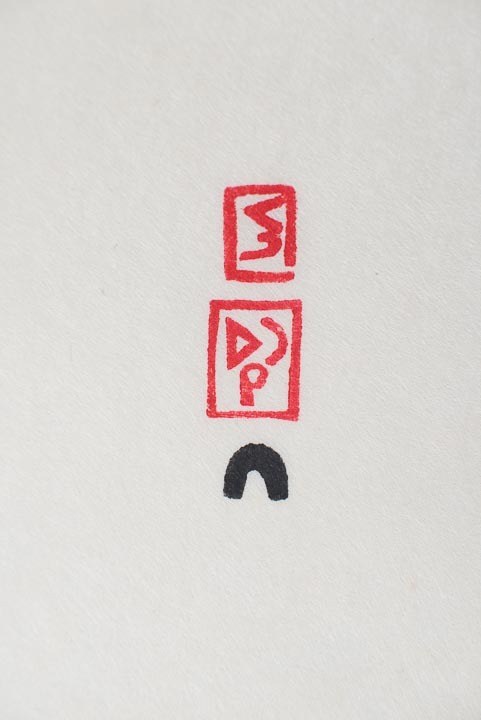 Qiatsuq Niviaqsie applies a home made igloo chop beneath his signature chop.I need to ask whether each stone cut printer has their own igloo chop or if they share the same one. carefully cleaning off the over inked areas before applying his signature chop.